Optimized for the Audiocore CCS-500 series, this Chairman Mic have the feature to mute all delegates at a touch of a button. 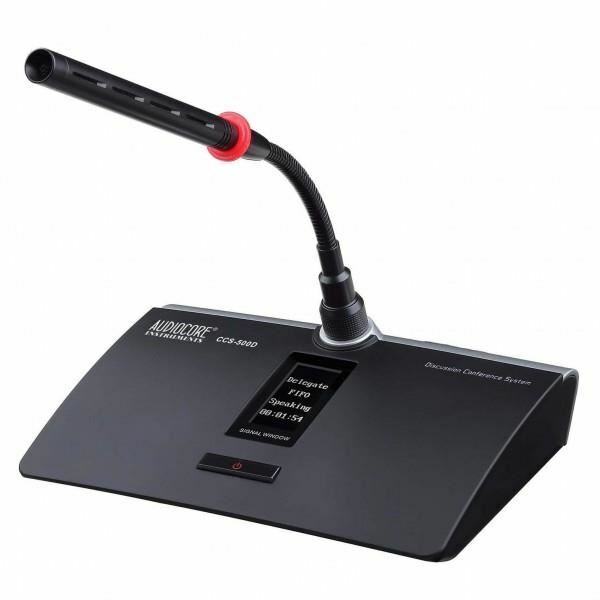 This mic can be connected to Audiocore CCS-100 series as well. Sennheiser SKM 6000 Handheld TransmitterMic genggam SKM 6000 ini bebas dari bentrokan sinyal, yang memungkinkan untuk dapat beroperasi dalam jaringan frekuensi yang sama. Sistem transmisi yang digunakan memungkinkan untuk bekerja dengan efisiensi yang makssimal, bahkan dalam rentang frekuensi tersul..
Audiocore WCS-1000M Wireless Conference System (Master Control Unit)Suited for the Audiocore WCS-1000 wireless conference mic series, this Master Control Unit uses latest and sophisticated wireless digital technology to process the audio signal and control signal with scientific ID code design witho..
Sennheiser EW 100- ENG G3Flexible ENG set for indoors and outdoors: EK 100 G3 adaptive diversity receiver, SK 100 G3 bodypack transmitter, ME 2 clip-on microphone, and the SKP 100 G3 plug-on transmitter that turns any XLR mic into a wireless one.OverviewThis ENG set offers a great amount of flexibil..